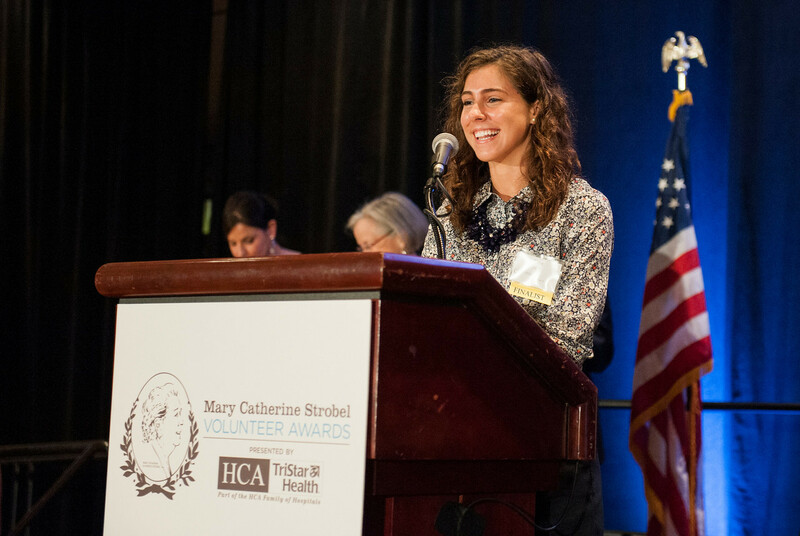 NASHVILLE, Tenn. – Eight Middle Tennesseans were honored for outstanding volunteer work today at Hands On Nashville’s 28th annual Mary Catherine Strobel Volunteer Awards presented by HCA/TriStar Health. Elise Hirt accepted the Youth Volunteer Award Presented by Baptist Healing Trust for her work to lead a Best Buddies chapter at Centennial High School. Best Buddies fosters relationships between students with and without intellectual and developmental disabilities. More than 700 volunteers and nonprofit agency representatives attended the luncheon and ceremony at the Marriott Cool Springs Conference Center. The annual event recognizes volunteers for their outstanding contributions to the community. 2014 Mary Catherine Strobel Volunteer Awards recipients, along with Michael Cassity (far left) and Chip Blaufuss (far right), both with HCA/TriStar Health and members of the Hands On Nashville board of directors. The eight award recipients were selected from 24 finalists and a record 139 nominees. Following is a list of award recipients for each category and a brief description of the volunteer work for which they are recognized. The Civic Volunteer Group Award recognizes representatives of civic, membership, congregation or noncorporate groups that volunteer together for a cause. 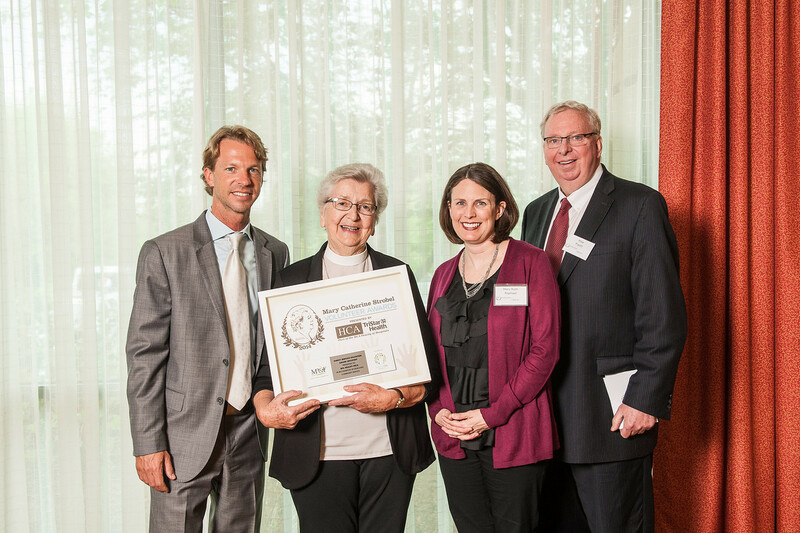 Covenant of the Cross, a Madison-based independent Christian church, has been named the 2014 recipient of the Civic Volunteer Group Award for its efforts to provide food to more than 220 hungry families every month through its Covenant Cupboard outreach effort. Covenant of the Cross has created a warm, affirming place for all people to receive the food they need, without judgment. The Capacity-building Volunteer Award honors individuals who provide significant operational or administrative support to a nonprofit agency, faith-based ministry, or community organization. Raymond White, pictured here in the center, accepted the Capacity-building Volunteer Award presented by c3/consulting. Raymond White has been named the 2014 recipient of the Capacity-building Volunteer Award. His advocacy of Project C.U.R.E. Nashville strengthens the agency’s ability to provide donated medical supplies to developing countries. He has forged partnerships with 15 hospitals through his outreach work, developed strategic communications tools, and secured a $25,000 grant enabling the organization to repair biomedical equipment. Triumph Aerostructures Nashville Team has been named the 2014 recipient of the Corporate Volunteerism Award for its work building capacity for The Nashville Food Project (TNFP) by donating time, skills, and financial resources to improve operations. During their volunteer work days, employees completed a renovation of TNFP’s kitchen area to create a more functional environment. The Direct Service Volunteer Award recognizes individuals who have participated in hands-on, direct service with an agency’s constituents. Rev. Felicity Peck accepted the Direct Service Volunteer Award for her work with CASA, Inc. of Davidson County. 2014 recipient of the Direct Service Volunteer Award for her work in helping abused and neglected children caught in the court system find safe and permanent homes. In her 20-plus years as a CASA volunteer, Peck has advocated for 36 abused and neglected children, and has given more than 3,300 hours. The Volunteer Innovator Award honors individuals or groups that have responded creatively to an unmet community need by designing a volunteer program, practice or response or by adding innovation to an existing program or agency. DeeAnn Hodge has been named the 2014 recipient of the Volunteer Innovator Award for helping at-risk girls served by Preston Taylor Ministries through the day camp she hosts called Camp Wonderfully Made. Since Hodge began Camp Wonderfully Made in 2012, 30 girls have participated in the camp, 18 will participate this summer, and eight have begun meeting for a weekly camp alumni gathering. The Youth Volunteer Award recognizes youth, teens and young adults ages 5 to 22 who serve as an inspiration to others through significant volunteerism. Elise Hirt, president and founding member of Centennial High School’s Best Buddies Chapter, is the recipient of the 2014 Youth Volunteer Award for creating a culture shift for Centennial students with intellectual and developmental disabilities (IDD). With Hirt’s leadership, Best Buddies fosters relationships between students with and without IDD. This has resulted in a more inclusive, welcoming, and informed student body. The Hands On Nashville Volunteer Award recognizes HON adult and youth volunteers who demonstrate a deep commitment to improving our community. 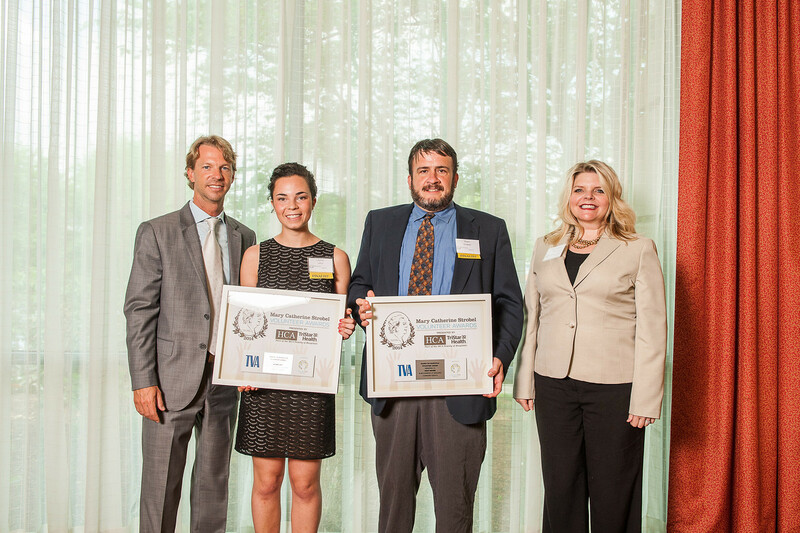 Dean Graber and Lauren Levy are the recipients of the 2014 Hands On Nashville Volunteer Award. Graber’s commitment to the city and the people of Nashville is exemplified in the nearly 100 community service projects he’s participated in through Hands On Nashville, including working in community gardens and working with people who are studying to become U.S. citizens. These projects combined led him to log more than 180 hours in 2013. Lauren Levy (center left) and Dean Graber (center right) accepted the Hands On Nashville Volunteer Award Presented by TVA, and received the Daily Points of Light Award for April 22 and 23, respectively. Amy G. Arnold-Martin is pictured far right. Levy is an intern with Hands On Nashville’s Youth Volunteer Corps, where she teaches a year-long arts program for 10 middle school students served by the YMCA Fun Company. In 2013, Levy worked with Hands On Nashville staff to establish the Summer Youth Leadership Program, engaging more teens in volunteerism and leadership. Last year alone, she gave 230 hours of her time to volunteerism. Both Graber and Levy have also been nationally recognized by Points of Light and former President George H.W. 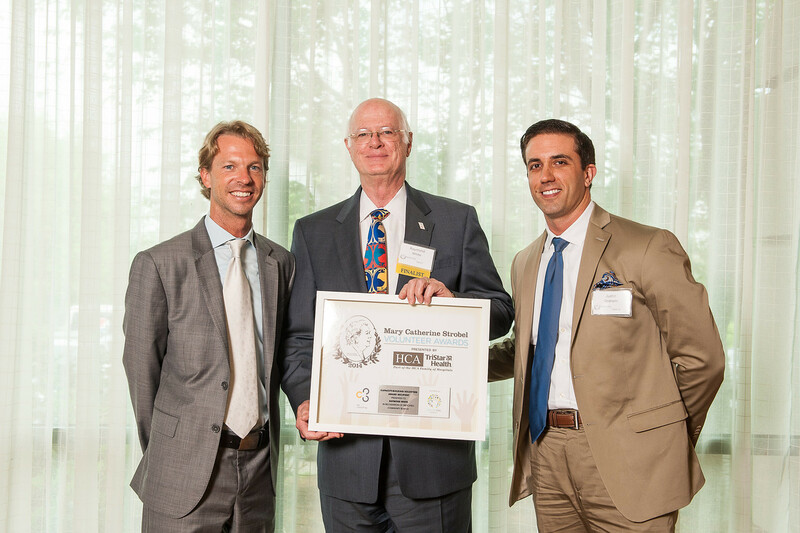 Bush as the country’s newest Points of Light Award recipients, having served the most hours out of all adult and youth Hands On Nashville volunteers in 2013. Since 1998, more than 5,000 Daily Points of Light honorees have been named, celebrating the impact volunteers have on communities around the world. The Mary Catherine Strobel Volunteer Awards are named in memory of the late Mary Catherine Strobel, known for her extensive and charitable efforts toward improving the lives of Middle Tennessee’s homeless, impoverished, and less fortunate populations. The annual awards ceremony celebrates Strobel’s service and recognizes those who continue her legacy. Hands On Nashville’s mission is to meet community needs through volunteerism. For more than 20 years, Hands On Nashville (HON) volunteers have been addressing critical issues facing the Middle Tennessee community such as hunger, homelessness and environmental protection. In 2013, HON connected or referred more than 123,000 volunteers to service opportunities, making it one of the largest volunteer resource centers of its kind in the world. Offering more than 300 volunteer opportunities to the community each month at HON.org, Hands On Nashville challenges everyone to find a way to give back and to … Be the Change. Volunteer. For more information, visit www.HON.org or call (615) 298-1108.